After a unique experience of driving through bad weather on our way to Ashmore, Marilsa, Noah, Brandon, Tom, and Gravy arrived at 3:00 pm. Upon our arrival, a man was observed doing some yard work on the property and three friendly cats were also noticed roaming the grounds of Ashmore Estates. Ashmore is a farming community and farm animals could be heard in the distance. The road that Ashmore Estates is located on is not traversed regularly, although traffic could be heard from a busier road nearby. As we waited for the Ashmore manager, the group took this opportunity to take some outside pictures. Once the pictures were taken, Noah met with Michelle the manager at 3:55 pm. 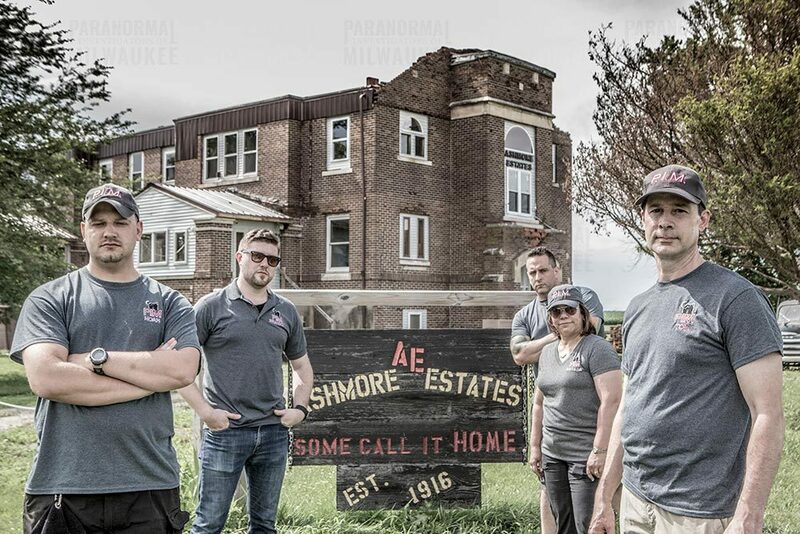 Michelle would be staying in one of the three air conditioned cabins next to Ashmore Estates during PIM’s investigation, remaining available in case of any questions or emergencies. At 4:00 pm, PIM got inside the cabin we had rented for the night and unloaded our sleeping gear. 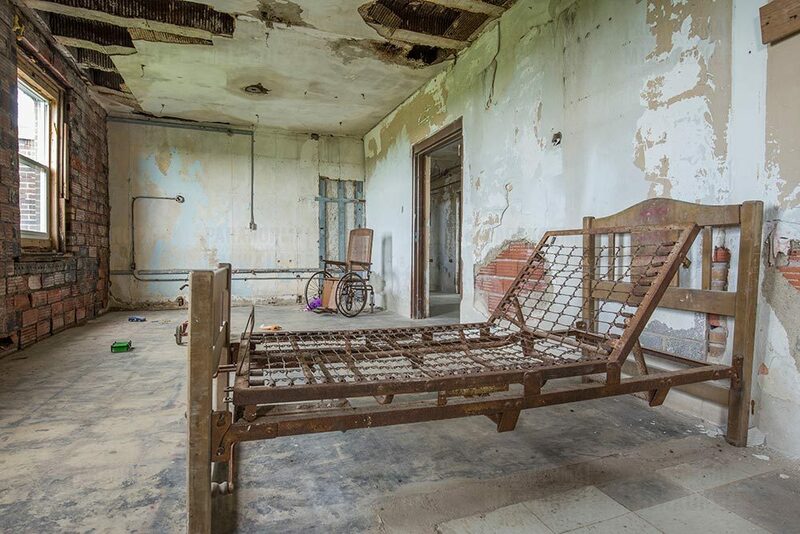 Immediately after signing the waivers, the group began to bring in equipment to the 1st Floor Team Room of Ashmore Estates. It was immediately noted that the floors in the 1st Floor were wet due to a combination of recent rainfall and high humidity. Once all equipment was brought into the Team Room in the 1st Floor, the group was briefed on any recent activities in the building by Michelle. 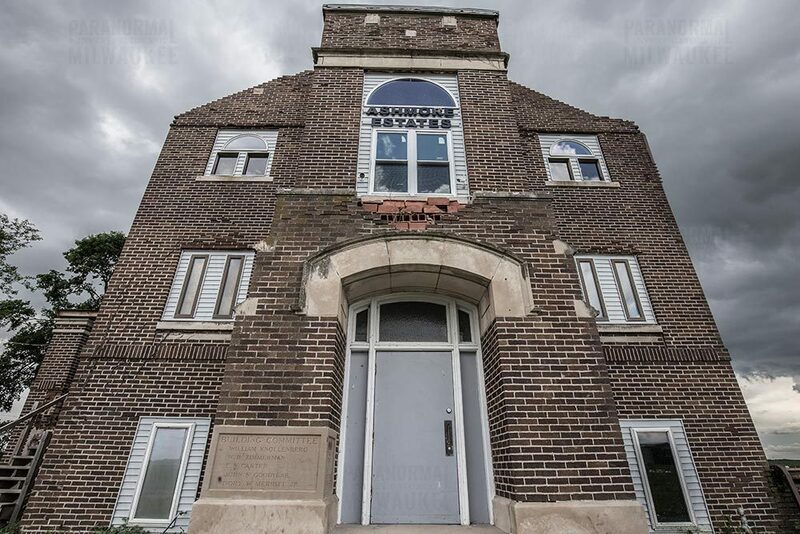 Noah and Gravy had investigated Ashmore Estates in 2014 and 2015 so a tour of the building was not needed. It was noted that the owner had done major improvements to the building. Even though a dead bird was found on the 3rd Floor, Noah stated that it was a positive improvement from the previous investigations. In addition, all the rooms and hallways had been named after sponsors through their monetary donations, making it easier to denote areas during baseline readings. 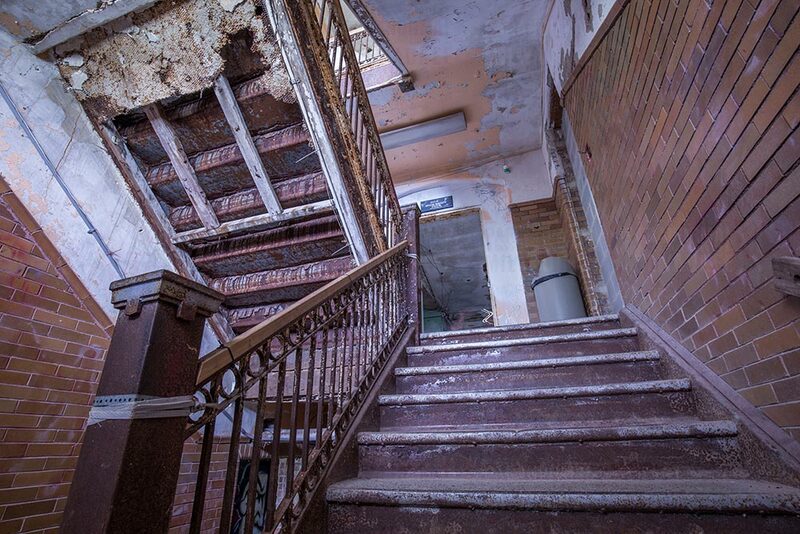 Ashmore Estates consists of three main floors with stairwells that allow access to all three floors located at each end of the building. The stairwells contain motion activated lights that cannot be turned off (per the owner’s instructions), so care had to be taken not to allow light contamination when moving between floors. On the 1st Floor, there are two climate controlled rooms designated for use as a basecamp (Team Room) with tables and chairs for use by visiting investigation groups. 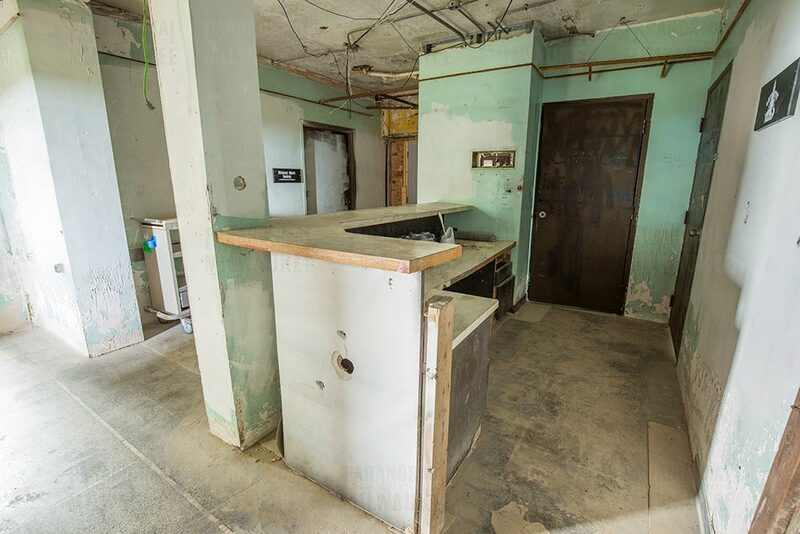 Across from these rooms, there is a small kitchen with a refrigerator and two bathrooms. The 2nd and 3rd Floor floorplans are similar with a Nurse’s Station, several Patient Rooms, and a Common Room area located on each floor. 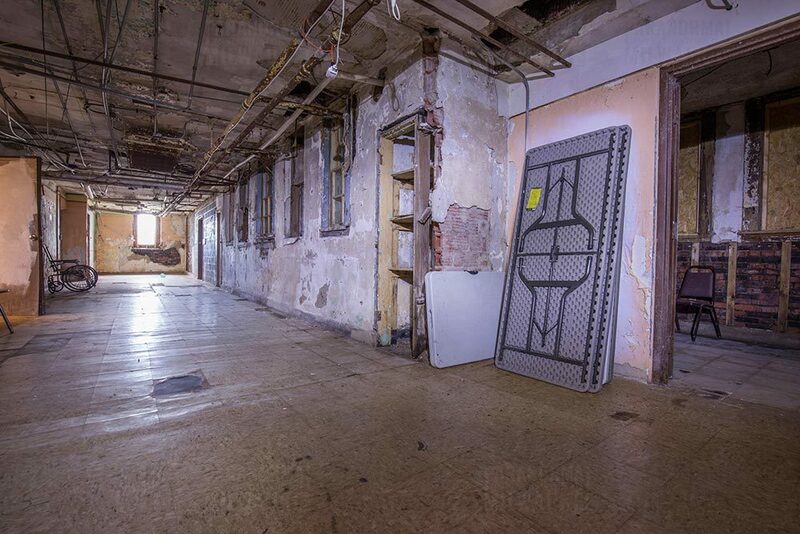 In addition, some have been furnished to emulate how the rooms may have looked when Ashmore Estates was in operation. Ashmore Estates also has running water (in certain areas)and electricity. 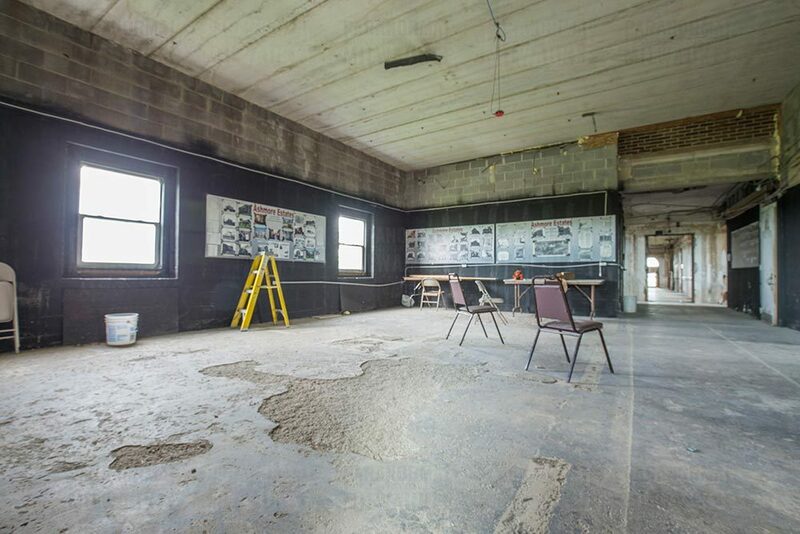 Since PIM was not allowed to cover any windows during the investigation, the main stair case was not used due to the large windows that would let in light from a large yard light located right outside the door that could not be turned off. Fortunately, these stairways have fire doors that can be closed, blocking most of the light. Typically, PIM tries to cover windows and doors, to avoid light contamination from outside sources. The group did the best they could without using tape per the agreement that they signed. At 4:22 pm, Noah instructed everyone to start their Zoom H1 control audio recorders and their Extech RHT50 data loggers before starting to setup equipment. Every member of PIM is equipped with a Zoom H1 digital audio recorder, which is used as their control recorder, and an Extech RHT50 datalogger. Control recorders are not only used as another recording device but also to discriminate sound contamination that an investigator might create during an investigation. Control recorders are started and time stamped first before any other equipment is started and they are turned off last to ensure any anomalous noises can be cross checked. Control recorders are also placed in a Faraday cage. A Faraday cage operates on external static electrical fields, causing any electric charge within the cage’s conducting material to be distributed such that it cancels the field’s effect in the cage’s interior. PIM’s main goal in using these cages is to block radio signals from interfering with their audio recorders thus causing false positive EVPs. The Extech RHT50 datalogger takes a temperature, humidity, and barometric pressure reading once a minute and is used to try and correlate environmental data with any personal experiences an investigator might encounter during an investigation. Everyone then began to set up equipment on tri-pods to make set up easier and faster. While the group dispersed within the building to set up the equipment, Brandon took the Environmental Data, baseline temperature, and EMF (electromagnetic field) readings using a Single-Axis EMF Detector Mel-8704 REM/SDD. Marilsa and Tom took additional EMF readings while setting up their equipment. Brandon went outside at 4:20 pm to record weather conditions using a Kestrel 3500 Weather Station. The Kestrel Weather Station is a tool that measures temperature, wind speeds, barometric pressure and humidity. Many 4K and high definition camcorders were placed in selected areas of this enormous building. These particular areas have been mentioned by other paranormal groups to have several claims. At 6:23 pm, the team began setting up equipment in the Basement. 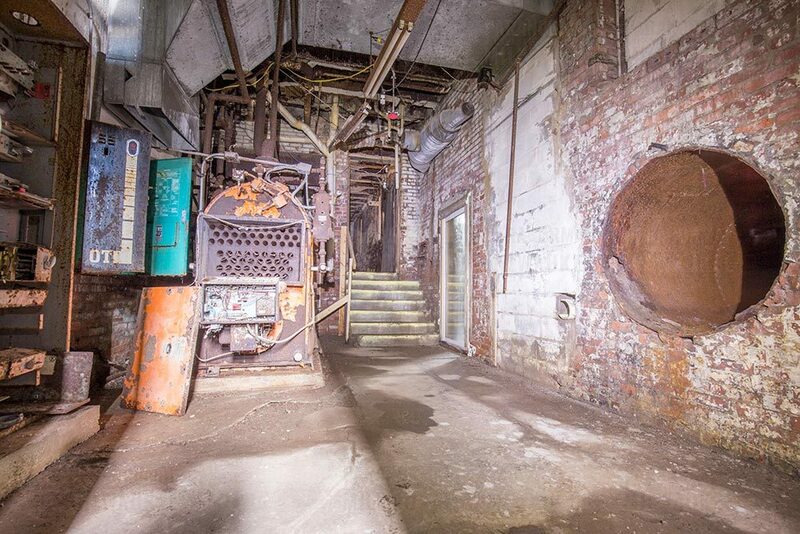 A Sony HDR-CX160 full spectrum camcorder, a Zoom H1, and an EDI+ were placed in the American Spectral room (Boiler Room). An EDI+ is a datalogger sensor for EMF, vibrations, temperature, humidity, and barometric pressure. Another Sony HDR-CX160 full spectrum camcorder was set up in Mary’s Hallway (1st Floor Hallway). Lastly, a Sony HDR-SR5 high definition camcorder was set up in Mary’s Room which is just off the Boiler Room. Mary is the name of an entity that psychic visitors of Ashmore Estates claim is present. Nobody knows who Mary was but believes she haunts this room. Zoom H1 audio recorders were set up in the Boiler Room and the 1st Floor Hallway in addition to the camcorders. The team proceeded to bring the equipment to the 2nd Floor at the Nurse’s Station area. A Sony HDR-CX610 full spectrum camcorder was placed to cover the Nurse’s Station and the Hallway. A Zoom H1 audio recorder, an EMF Pump, a Mel-6704R-VIBE EMF detector, a DM X-930 Dark Matter Detector, and an Extech RHT50 datalogger were placed on the counter of the Nurse’s Station. An EMF pump emits electromagnetic fields into the atmosphere which is believed to be a great energy source for spirits to manifest. The geophone was custom built by PIM and has adjustable sensitivity. The geophone senses seismic vibrations. If any of the trigger objects (see below) would be moved, the geophone would sense any vibrations. The Mel-6704R-VIBE EMF detector device measures EMF and ambient temperature with rapid response. It also detects vibration and will produce an audible tone and LED light indication when a vibration is detected. A Dark Matter Detector is a device that measures EMF, temperature, barometric pressure, and also has a high quality audio recorder as well. In addition, at the Prairieland Paranormal Consortium (common room) facing the Nick Groff Tour Hallway, a Sony HDR-CX440 was used. PIM also placed a Zoom H1 audio recorder next to the Free Agents room. A Mel-8704REM/ATDD/SDD EMF detector was placed on the 2nd Floor Hallway as well. PIM utilizes trigger objects to try and provoke interest and activity from entities. The trigger objects used on the 2nd Floor were: touch flashlight, cigar, bullet, pair of dice, cigarettes, Rosary, and a pocket watch. The touch flash light can only be turned on if the side is touched completing the circuit. A POV Full Spectrum camcorder was placed facing all the trigger objects on the Nurse’s Station counter. 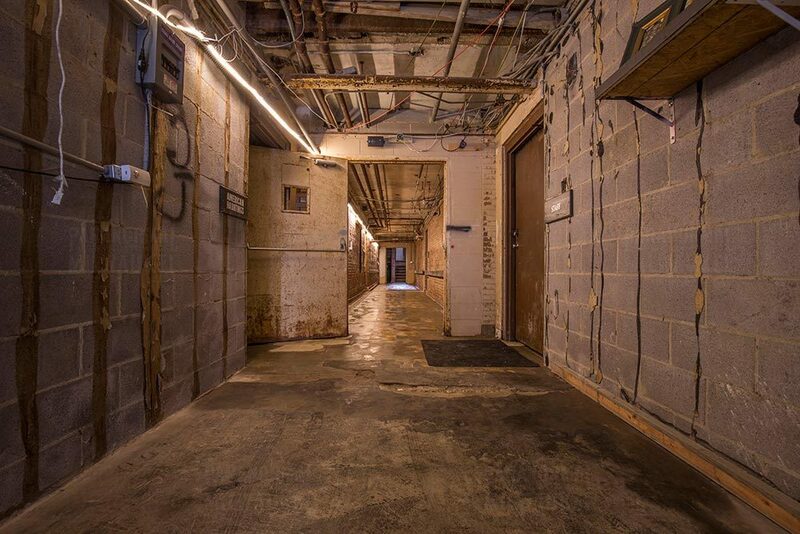 On the 3rd Floor, two camcorders were placed on opposite sides of the building to cover the long hallway. At Angel’s Nest (common room), a Sony HDR-CX160 full spectrum camcorder along with a Zoom H1 audio recorder were placed focusing on the hallway towards the Nurse’s Station. Facing Christopher & Rachel Booth Hallway and next to the Midwest Paranormal Society and stairways, a Sony HDR-CX160 full spectrum camera was placed facing the hallway towards Angel Nest and the Nurse’s Station. At the Nurse’s Station counter, a POV full spectrum camcorder faced the following trigger objects: touch flashlight, horse, doll, cigar, jack set, bullet, pair of dice, whiskey, deck of card (queen, club, jack, diamond), bell, Rosary, nurse hat, pentagram necklace, and latex gloves. PIM used an Extech RHT50 and Zoom H1 (silver) audio recorder and placed it on the counter of the Nurse’s Station. After getting all the equipment setup, the team started and time stamped everything. Time stamps, from a designated atomic watch, are used as a point of reference and make cross referencing easier during evidence review. All lights were turned off at this point in order to set illumination with infrared lights to ensure the cameras will have a clear picture when recording at night. Once this was done the group stopped their control recorders at 5:27 pm and left the building to go to dinner. It was noted before leaving for dinner that the temperature on the 1st Floor was cold enough to see your exhaled breath. The group returned at 6:36 pm to the bunkhouse and prepared for the investigation. It was observed that a thunderstorm was approaching Ashmore Estates. From 7:00 pm until 7:21 pm, the team time checked all the equipment inside the building and proceeded on a dinner break until 8:10 pm. At 8:18 pm, PIM entered Ashmore to initiate the investigation by starting their control recorders. The thunderstorm arrived at 8:20 pm. At 7:15 pm, Marilsa heard wind chimes while setting up the equipment at Angel’s Nest in the 3rd Floor. Upon review, her control recorder captured and corroborated the sound. The team did not know the location of sound and did not find an object that could replicate the same noise. However, PIM does not believe this to be paranormal in nature and is including it simply as an example in case other teams report it. At 9:15 pm, PIM situated themselves and began control silence to become familiar with the surrounding sounds from the location. PIM uses “control silence” which is a method practiced at each new location in a building. It allows for members to get a baseline of noises the building could make throughout the night. It also allows for the group to tag outside noises heard in that area so as not to be mistaken as something paranormal later in the night. This also allows for the building to reset itself after members or PIM have been walking around. At 9:19 pm, the team started an EVP session. At 9:22 pm, the team said Brandon’s name and a noise was heard that sounded like a stone hitting the floor. At 9:24 pm, after saying Brandon’s name for a second time, similar noise was again heard. The third time that Brandon’s name was said, nothing happened. It was suggested that the sounds where of ceiling plaster/peeling paint chips hitting the ground in various areas. Upon further investigation, the team could not find the source of the sounds. At 9:36 pm, Noah, while sitting outside next to the Terri McGuire room, stated that he felt a cold breeze. No source for the breeze was determined and nothing else occurred during this session. The team then proceeded to the next location. The group concluded that it was probably a bat flying by Noah that caused the breeze. 9:54 pm it was decided to end the EVP session and move to the 2nd Floor. At 9:57 a control silence was initiated. At 9:58 pm, during the control silence, Marilsa reported hearing a sound which she described as a soft whisper. At 10:00 pm, the EVP session started. At 10:09 pm and at 10:14 pm Brandon and Gravy stated that they heard a loud “tonk” noise. They believe that it could have been a raindrop. No other events occurred during this session and Noah directed the team to take a break from the investigation. Upon further review, Marilsa’s controller captured the unexplained sound that she reported at 9:58 pm during the control silence. The team took a break. They checked their equipment and replaced SD cards as needed. Later, they got together and at the base camp to discuss the night’s events and allow the equipment to run without human interaction. Everyone took a seat in the room next to the Boiler Room. At 11:02 pm, control silence was observed. At 11:04 pm, the EVP session was initiated. At 11:11 pm, Gravy heard a tap on a table. Gravy also heard a door closing softly from far away. Noah left at 11:17 pm to check the main door. Nothing happened during this time and the group moved on to the next location. At 11:29 pm, Brandon thought he heard a door opening on the 2nd Floor. Gravy and Brandon went to the 2nd & 3rd Floor trying to debunk or replicate the sound but they were unsuccessful. After attempting to communicate via EVP session, no responses were heard. 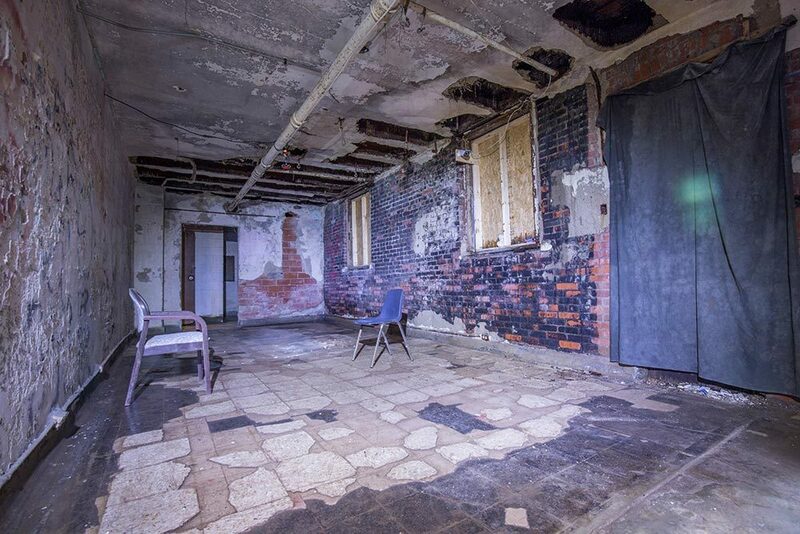 It was decided at 11:33 pm to continue the investigation in the Paranormal Free Agent Room (2nd Floor). At 11:36 pm, the stationary audio controller located in the Boiler Room, captured a loud noise of a pebble or rock hitting and bouncing two times on the floor or table. Numerous unexplainable sounds were captured (irregular tappings on metal or objects being thrown) which are most likely normal building noises. Everyone picked a spot to sit throughout the 2nd Floor Hallway. The team observed control silence before starting an EVP session at 11:44 pm. At 11:40 pm, the team heard some howling. Note: The team concluded that the noise was coyotes howling in the distance. 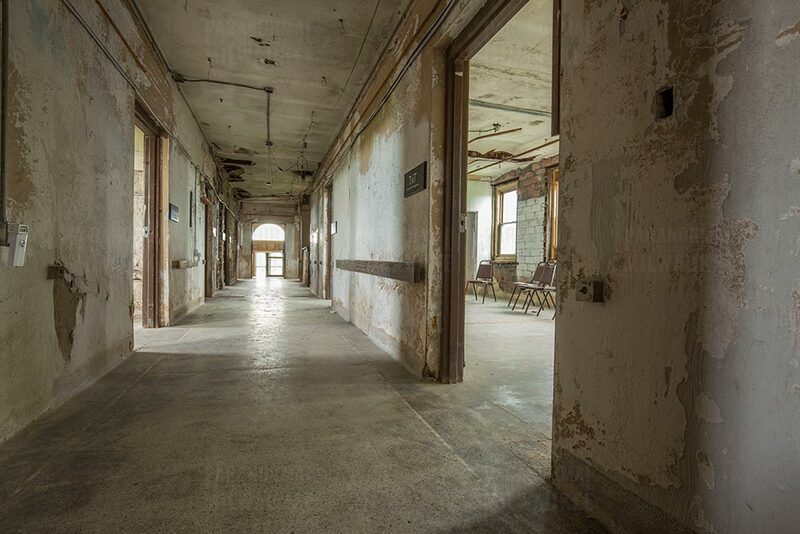 At 11:54 pm, the group spread throughout the Nurse’s Station and observed control silence before beginning an EVP session. At 11:57 pm, the team started the EVP session. No events of note occurred during this session. At 12:13 am, Noah leaves the group due to back pain and goes to the bunkhouse to take a break and allow the team to continue to investigate. The control silence was initiated at 12:20 am. PIM started the EVP session at 12:22 am. At 12:27 am, Marilsa stated feeling cold. She was sitting next to the Nurse’s Station in the hallway. No other events occurred during this session and the group decided to move to the next location. Upon video review, the POV camcorder captured a bat flying around Marilsa. The wind flow produced by the flying bat explained why Marilsa felt cold. The control silence was at 12:33 am. The EVP session started at 12:40 am. At 12:41 am, Tom reported feeling cold. Tom sat in the same location where Noah reported feeling cold in a previous EVP session that evening. However, the team believes this is most likely due to bats flying around. No other events of note occurred during this session and the team decided to move to the next location. Control silence started at 12:36 am. The EVP session began at 12:49 am. No activity was noted during this time and the team decided to end the investigation. PIM broke down all their gear, stopped their control recorders and packed their equipment in the van before heading out to the bunkhouse for the night. The PIM team in front of…well, you can probably guess. Even though the investigation did not produce any evidence of the paranormal, PIM had some interesting experiences during the investigation which need a rigorous evaluation. Ashmore Estates is an interesting building with an extensive history. 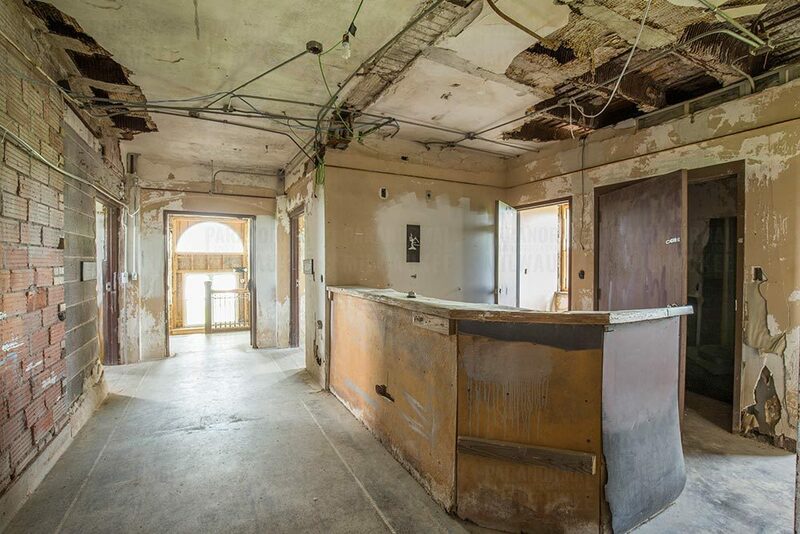 The owner has cleaned and repaired the building very well, making it a much better location to investigate than during PIM’s previous investigations. There is still the possibility of animal infestation as evidenced by the bats that were captured by our full spectrum camcorders in the 3rd Floor and the dead bird. However, the building is still light years ahead of where it was a year ago. The cabins located next to Ashmore Estates were in excellent condition. 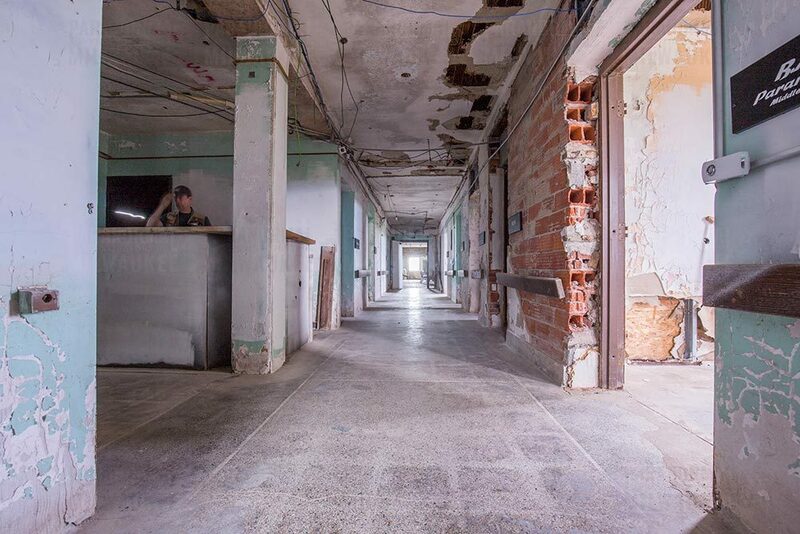 PIM would consider revisiting this location in the future and looks forward to returning to further investigate this location in hopes of unraveling the mystery of the claims of Ashmore Estates.